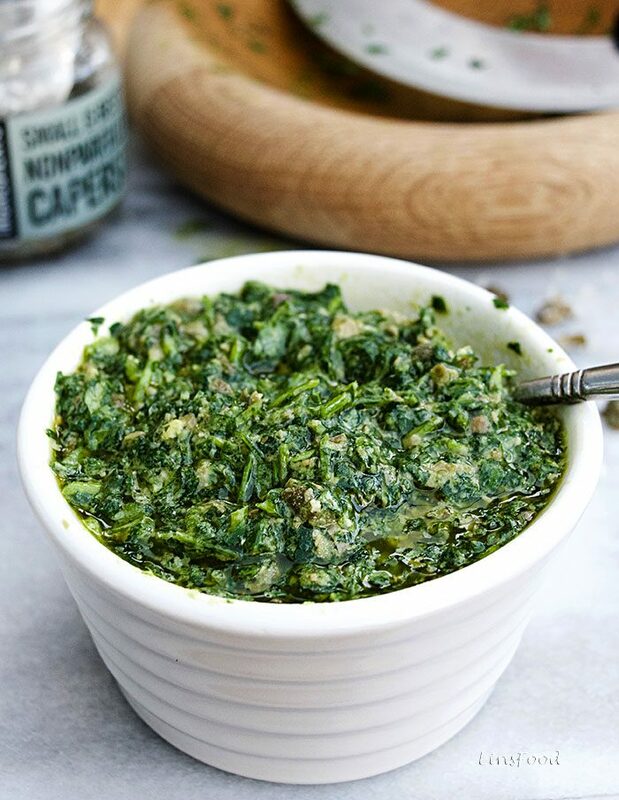 The Italian Salsa Verde is a sharp, piquant, salty and herby green sauce that will electrify your senses and leave them hysterical in anticipation of the next mouthful! Really! To many, if not most, people on the other side of the Atlantic (the US side), salsa verde refers to the Mexican Salsa Verde, made with fresh coriander leaves (cilantro), tomatillos and green chillies. However, to those of us on this side, salsa verde refers to the Italian version, made with fresh parsley, capers, anchovies and vinegar. Known as bagnet vert in Piedmont, it literally means green sauce, and traditionally, is used to accompany bollisto misto, or mixed boiled meat. However, its vibrancy in every aspect, makes it the perfect sauce for so much more. Naturally, there are variations to this Piedmont recipe, depending on the cook, the family and the exact part of Piedmont it is made. It is the perfect sauce for making to one’s own taste. As an accompaniment to meat, not just boiled but also grilled. I almost always serve it with roast lamb, along with the more traditional mint sauce. Unless my mother in law is coming to dinner! Anchovies and lamb – you know they are an awesome match, don’t you? But I think this Easter, I shall serve it, without mentioning the word anchovies! Traditionally, this was all done with a mezzaluna, that curved, double handed knife. You can just about see it in the image below. These days though, the food processor makes that job so much easier, so feel free to go down that route. 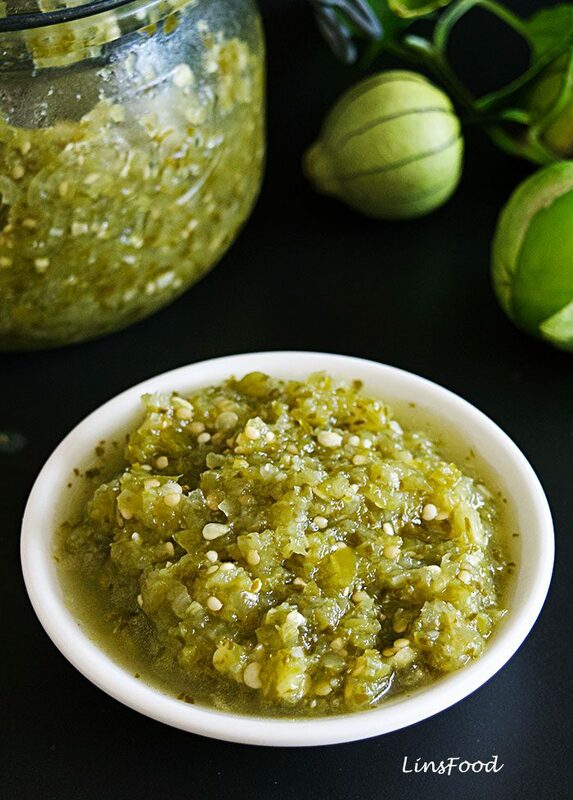 While I always use the chopper to make pesto, and so many other sauces, when it comes to this Italian salsa verde, I have found that I much prefer the sauce handmade. Then you truly have a rough and ready, rustic sauce, so much more effective on your senses, with every single mouthful. It only takes me 10 minutes to do this, for the amount of ingredients here; less than 5 to do the parsley. The overriding green, grassy notes and colour of the salsa verde should be that of parsley. If you use another herb, it should be a very small amount, as suggested in the recipe below. That second herb is usually basil, I have never seen mint used in it apart from in Jamie Oliver’s version. If you have had mint in yours in Italy, pray tell me in the comments below. I have, for many years, been using white wine vinegar, because I much prefer the lighter taste of white to the fuller bodied red. It does rather solve the problem at Easter, when we have both lamb and fish! Lemon juice works too, it adds tang, but the sauce feels like it’s missing something when I’ve gone down the lemon juice route. So room for experimenting, folks, because, you make it to your taste. “hard on delicate stomachs” (translated). Like the other Piedmont classic, bagna cauda, the anchovies play a big part in this sauce. However, I know many people who cannot stand the sight nor the smell, and leave these intimidating fish out. 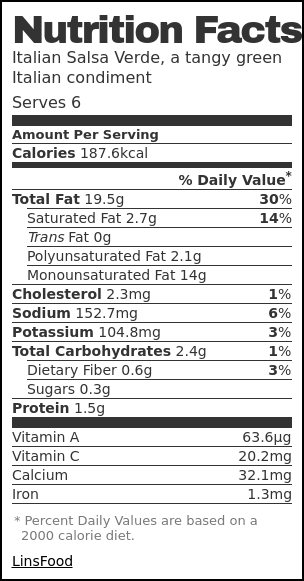 So by all means, do so, if you are an anchovy hater or a vegetarian, but, you will be missing an important part of the final flavour. 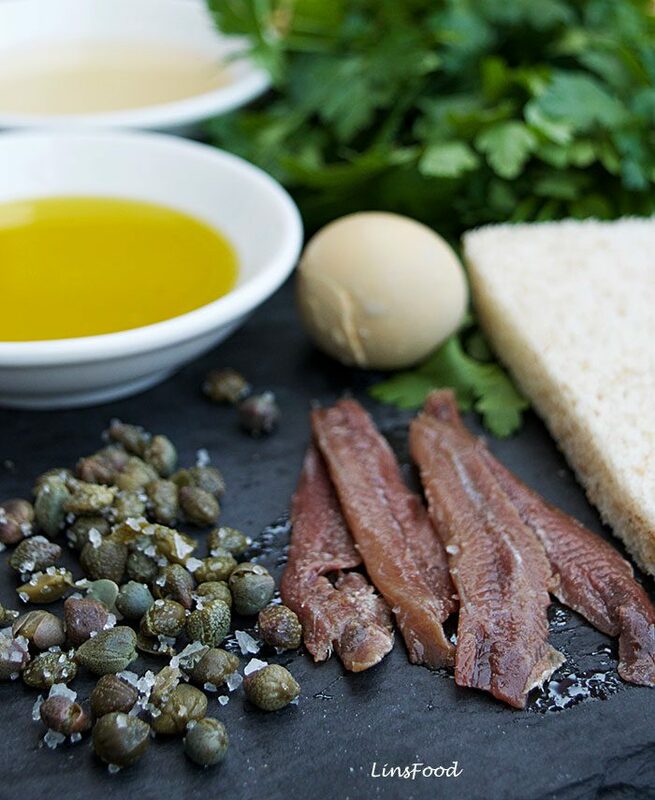 Anchovies are full of umami notes. if not using anchovies, you can use some cornichons (maybe 2 small ones) and half a dozen olives in brine instead. Which probably explains the cornichons in Jamie’s recipe, despite the anchovies he uses. Many, many recipes call for a little stale bread and/or a boiled egg yolk, to act as a thickener. Marcella Hazan doesn’t have either in hers, but she does use a little mustard, which is very interesting. It adds a touch of heat and lends even more sharpness to the final sauce. I don’t use any in mine. I love adding both a mashed egg yolk, as well as some bread to mine. They just blend in so beautifully and add just a hint of creaminess to the whole piquant and briny constitution of the sauce. Super easy, just leave out the anchovies and the egg yolk. How long will Salsa Verde keep? Store it in a sterilised container, top with a little olive oil to cover the surface area. Then sore it in the fridge for up to a week. Salsa Verde also freezes well. Place it in a freezer proof container, cover with clingfilm, touching the surface of the salsa verde, and freeze it for up to 3 months. Just let it thaw at room temperature before serving. Depending on the amount, a couple of hours should do. All in all, the Italian Salsa Verde is yet another favourite of mine, and I have a small jar of it in my fridge that I shall be using up today to make up some potato salad. There you have it, all the ins and outs of making Italian Salsa Verde at home. Have you tried it, and if you have, are you a fan? 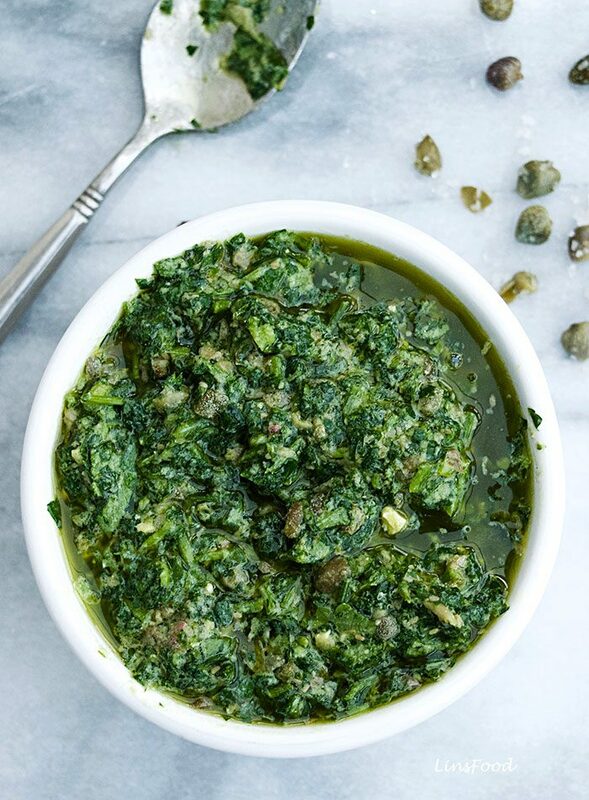 The Italian Salsa Verde is a sharp, piquant, salty and herby green sauce that will electrify your senses and leave them hysterical in anticipation of the next mouthful! Rinse the capers and place them in a small bowl of room temperature water to soak while you get the other ingredients ready. Do the same with the anchovies if they are salted, if in oil, just pat them dry with a kitchen paper. Tear the bread up, place in a small saucer, and pour the vinegar over, squashing down the bread to soak the vinegar up. Using a mezzaluna or a large, sharp knife, chop up the parsley until fine, place in a medium sized bowl. Mash the egg yolk up, if using, and add to the parsley. Smash the garlic up with the side of a knife, and chop up finely, or just mince it with a garlic crusher, which I do. Add to the bowl with parsley. Rinse the capers again, and chop up with the mezzaluna or knife, fairly finely. Add to the bowl. Mash the anchovies up with a fork. Add to the bowl. Mash the bread up with a fork, and add the whole lot to the bow, including any drips of vinegar. Now, add half the olive oil, and mix it all up thoroughly with a wooden spoon. Keep adding the olive oil until you are happy with the consistency of your salsa verde. I like mine fairly thick and sloppy. It does depend on what you want to use it for as well. Make it on the dry side if it's going to be a spread or topping. Place all the ingredients (start with half the olive oil) in a chopper and blitz to the desired consistency. Store in a sterilised container for a week. Bring to room temperature and stir well before serving. Hi Laurie, yes, it freezes very well. But I’d freeze it for no more than 3 months. I’ll add that to the post above. Thank you, Azlin, this is a completely new sauce for me. I am really curious about the anchovies in them. Definitely making it for Easter, saved! Great, it goes fab with the lamb. Let me know what you think. Delicious! I’ve never heard of this Italian salsa! Looking forward to making it! Thank you Katie, let me know what you think. Brava, another super Italian recipe to show my non Italiano friends here in London! Grazie, have a good weekend! Thank you for this in depth article on this salsa. I feel like I know it a little bitter after reading your explanation. I love it, I think I might try it this weekend. Thank you, Michel, I appreciate that. If you do, be sure to let me know.